I like vegetables. I think I am okay with all types of vegetables except the obvious bitter ones eg. bitter gourd. I know it is good for health but I usually give it a pass. Not with green leafy vegetables though. There are many varieties of lettuce around and most of them can be eaten raw or cooked. If you intend to stir-fry the lettuce, make sure that your wok is really heated up to very high temperature (smoking) so as to minimise cooking time and to prevent too much water oozing out from the leaves. The idea is not to have the vegetables swimming in a pool of gravy. You also lose a lot of essential vitamins and minerals by prolonged cooking of the vegetables. 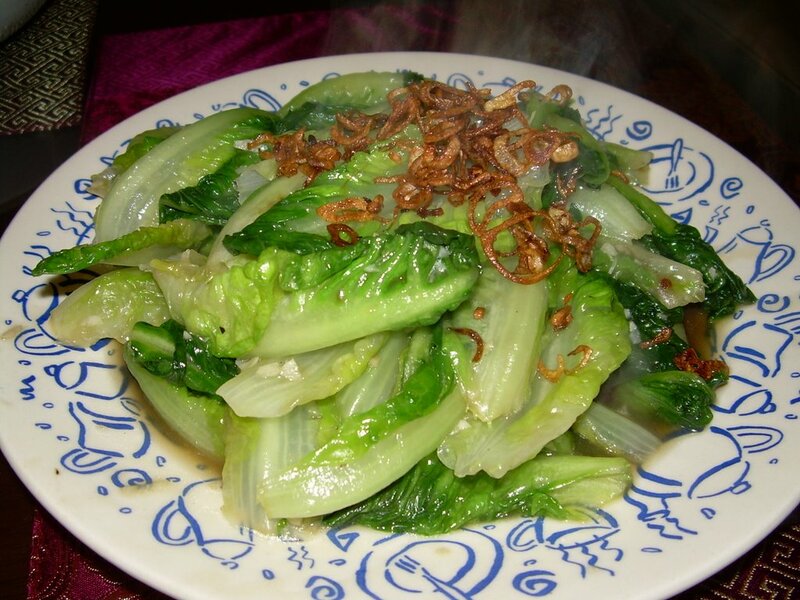 Here, I use a type of lettuce known as “Yau Mak” which is a slightly smaller version of the romaine lettuce. I should have taken a photo of it before the leaves were separated and rinsed. Heat up oil in wok and fry shallots till golden brown. Remove fried shallots aside. Add garlic into remaining oil and stir fry for about 10 seconds followed by yau mak. Give it two or three stirs and add oyster sauce. Stir till leaves are evenly coated with sauce. I like the leaves crunchy, so I do not usually stir fry them for more than 1 minute. Sprinkle fried shallots prior to serving.